There are countless signs of wealth, countless ways to distinguish the 1% of the average populace, people often say. Many of these are curiously linked to water. Whether it’s owning a yacht or living on a tropical Pacific island, it’s the wealthiest and those with the most prestige that get to surround themselves with more H2o than the average Joe, it seems. But the one that represents the cherry on top of this watery cake is definitely being in possession of a swimming pool, preferably quite a large one. However, those who do own one of those will know from experience that it’s not a show-off machine, and it doesn’t take care of itself. In fact, pools of all kinds need lots of attention to keep their clean, envy-inducing appearance. Which is why we took the liberty of selecting ten of the best pool cleaners from the myriads of devices currently available and listing them here. Thank us later. 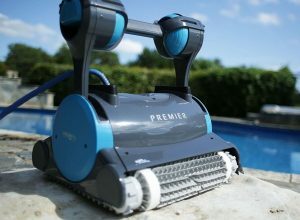 Here is the top-rated robotic pool cleaner in 2019. When it comes to pool cleaners, many would argue those of the robotic kind are the cream of the crop. After all, what could possibly be more convenient than an intelligent, autonomous device that not only cleans every single spot but does so without needing any of your attention? We tend to agree, however, many of these pool cleaning robots often fall short of expectations. Either they need to be recharged way too regularly, or they aren’t as truly independent of you as their marketing would lead you to believe. Or, very commonly, they are just wildly overpriced, inaccessible to even somewhat affluent pool owners. The great thing about the Nautilus Plus? It exhibits none of these flaws. Essentially a larger, more heavy-duty-oriented version of the already great Dolphin Nautilus, the Plus model may not be the company’s most expensive or feature-packed offering of them all, but it does positively surprise in many ways. From its smart anti-tangle cable design to the intelligent pool scanning feature, which practically eliminates missed spots, to the high-powered water filtration system that cleans much more than just the pool surface, the Nautilus Plus has all the gadgets and gizmos of its most expensive competitors. The only caveat? The built-in filters are not likely to last for nearly as long as the machine itself. Clearly, Dolphin had an incentive to design them that way; it allows them to sell add-on and replacement filters at a high cost. Unfortunately for the consumer, there is no solution other than to put up with this design flaw and enjoy the Nautilus Plus core strengths. 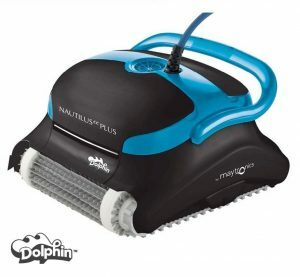 In conclusion, the Nautilus Plus by Dolphin is one of the best robotic pool cleaner’s we’ve ever reviewed. It’s reliable—if you forget about those pesky filters—it’s as mechanically simple as the design allows, it’s intelligent and functions completely without your supervision as it should. It cleans as much as physically possible in the shortest amount of time and with the least amount of fuss, and we could go on for hours. Add to all of that the rather affordable sub-four-figure price, and you’ve got a great deal. When manufacturers try to combine the high-end in features with the low-end in price, the product is only bound to fail spectacularly. Or is it? The Breeze XLS by Aquabot begs to differ. Sure, it may not have the brand bias at its disposal thanks to the relatively unknown name, but at least it tries to impress with its performance instead. 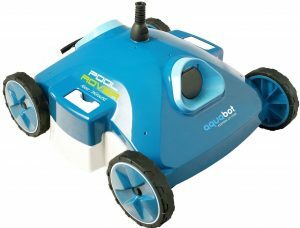 Combining the best of both worlds, this robotic, fully autonomous pool cleaner boasts with having all the features, gadgets and tricks up its sleeve that is commonly found on luxurious, high-priced models by the big brands. From that handy anti-tangle cable design, although only up to 70 degrees as opposed to the competition’s 360, to the dual-filter water purifying system to the intelligent pool scanner on the bottom, it ticks all the right boxes. What’s more, unlike some more cumbersome models populating higher price brackets, the Breeze XLS is rated for both in-ground and above-ground pools. However, its pricing comes off as very budget-friendly, at an MSRP of just $415. That’s less than half of what the models the Breeze XLS is trying to compete with sell at. Sounds like quite a bargain, doesn’t it? 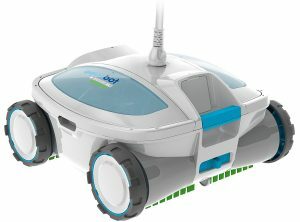 Unfortunately, there is no secret formula that enabled Aquabot to develop this model. There is no magic trick, no special technique, it’s exactly as you would expect: The Breeze XLS is deliberately made using the cheapest components available. That is the only way Aquabot could cram in this many features and gadgets into such a budget device. The pitfalls? Quality, of course. Don’t expect this one to last. And don’t expect its pathfinding, scanning or filtration systems to rival those of Polaris or Dolphin, either. 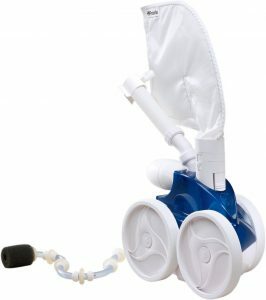 In the end, the Aquabot Breeze XLS is just what it looks like. A bargain. However, buyers will need to realize that this doesn’t rid it of quite a few compromises. Whether you really want to forgo those additional few hundred dollars in exchange for longevity and general quality is up to you, of course, but make no mistake: The Breeze XLS, as good as it is at what it does, is not a competitor to those devices costing twice as much. That part is just pure PR. From the same geniuses that gave us the Dolphin Nautilus Plus, here comes the Premier. With a sci-fi look that is sure to polarize critics, and a mechanical design borrowing much from its slightly less expensive brother, the Premier is set to be Dolphin’s, well, premier range-topping model, the king of the hill so to speak. Improvements include an upgraded navigation system, much lower power usage, more brushes and even more filters. Additionally, you get one additional year of standard warranty for a total of 3. Performance-wise, it’s as good as you would expect it to be. Thanks to the four simultaneously working filters, it cleans like nothing else, and you can really see the improvements on the navigation tech watching the Premier’s movements on the pool floor. It’s definitely much more efficient, never gets stuck, and always seems to know where to go next. Whereas the Nautilus Plus would sometimes have problems with very steep angles and high walls, the Premier climbs them effortlessly. What’s more, for cleaning mainly floor residue and detritus, you can equip the Premier with a handy, oversized bag as found on many compact cleaners. However, when it’s time to purify the actual water, simply plug in any of the many filter media and you’re ready to go. Perhaps it would have been a slight improvement if you were able to use both filter and bag at once. After all, switching to and fro every second day or so can get tiring. Additionally, we were slightly disappointed to find that the Premier includes neither a caddy for easy transport nor a remote control. Bummer, as otherwise, the Dolphin may have been the best pool cleaner ever, period. As it stands, it’s just about the best, but with quite an asterisk. If you absolutely want the most capable, reliable and efficient pool cleaner out there, then the Dolphin Premier may very well be your best option of them all. Still, don’t expect a perfect design; this one does have a few minor flaws and quirks. Overall, though, there are few things that can beat it when it comes to daily use. 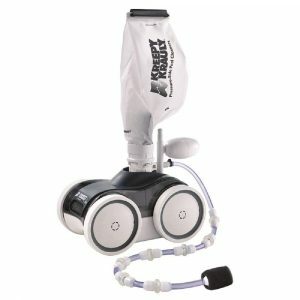 Think you can’t get any more budget-friendly without (terribly) compromising on performance than the Aquabot Breeze XLS? Think again. The Pool Rover is everything that it’s sister model was, but taken to another extreme. Even less expensive, but bragging even more about its capabilities. This is what you end up with when you design a product solely around its price-performance ratio. The Pool Rover does stay true to its name; we imagine that, with a different paint job and some minor touchups, it wouldn’t look totally out of place traversing the surface of the Moon or Mars. But chances are most people won’t be buying the Rover for its looks. 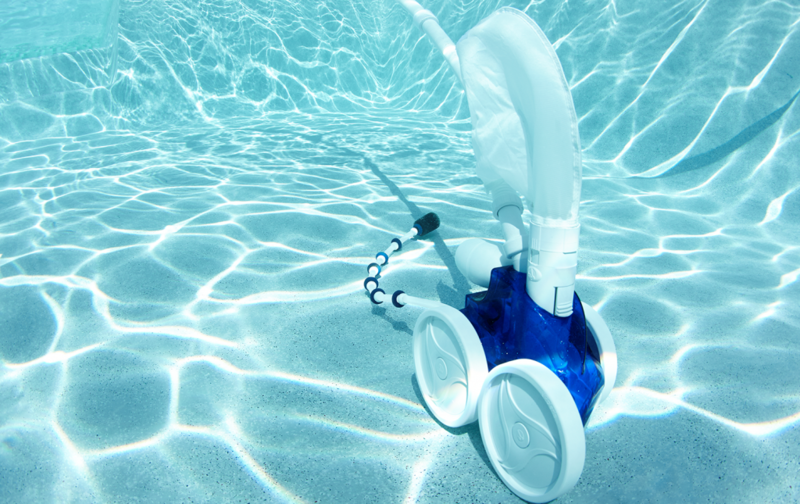 Instead, they’ll be looking for something that can give them a clean pool, quickly and without hassle. Is the Pool Rover just that? Maybe. Depends on the person and the pool. It does clean with some fervor and speed, that’s for sure. It also has those anti-tangle cables all the high-end cleaners sport, and it scans the ground layout too, so there’s barely a chance you’ll have to step in to tell it where to go or to remove it from an obstacle it’s gotten stuck in. It’s also pretty compact in size, so reach is borderline excellent. What’s not so excellent is, to name one thing, the filter media. There are two slots for two different kinds, and while that’s generous, it doesn’t really matter what you plug in there; the actual filter isn’t that good. And you don’t get a bag, either. Not to mention the suction power, which leaves something to be desired, too. Oh, and the fact that the Pool Rover is practically useless in in-ground pools due to the way that the pathfinding is programmed. Clearly, this is one pool cleaner one has to be very patient with. It’s not the most well-built or the most efficient, but if you know when and how to use it, it can be a real money saver. And for that reason, it does deserve a spot on this list. Here are the best suction pool cleaners below. How about something different? So far, we’ve looked a lot at those newfangled robotic pool cleaners, but salivating at their high-techiness might actually make you forget about some more old-school, hands-on ways to get that pool shining and sparkling like new. Case in point, suction vacuums. Yes, these are basically nothing more than regular vacuum cleaners with a suction cup-like front end, but you know what else they are? Effective. Really. Effective. They won’t intelligently move around and clean the entire pool in one fell swoop, that’s what good robots are for, but if you can spare the time to just let one run for a few extra hours, they can yield results that are just as good, if not better than the much more expensive competition. A good example of this is the Automatic Suction Vacuum by XtremepowerUS. At less than a hundred dollars, it does seem like a steal, but can it offer the same performance as a $1,000 Dolphin, minus the electricity bills? In theory, yes. Even if you take into the account the much longer time required to get a good clean, the XtremepowerUS isn’t that different in performance from its robotic brethren. Hose tangling is a non-issue thanks to adjustable elements, and there are even add-on weights for you to play with! Build quality is pleasing, but not stellar. It’s mostly plastic, of course, but it gets the job done. What will really put off many prospective buyers from going a little old school on their next pool cleaner, though, will probably be the need to buy a suitable filter and pump. Yes, that’s right, the XtremepowerUS doesn’t come with either of those; you’ll need to buy them separately, which will bump up the price to robotic cleaner levels. Is it still worth it then? Your choice. One of the most efficient alternatives to the autonomous cleaners currently flooding the market, the Automatic Suction Vacuum is a no-nonsense machine, effortlessly doing the job much more advanced, error-prone and complicated rivals brag about. Still, it’s slow, which will throw off some, and then there’s the need to buy separate filters and pumps. The BARACUDA G3 by Zodiac, another suction vacuum cleaner, aims to impress with its noiseless operation, low-speed pump compatibility and variable flow pump design. 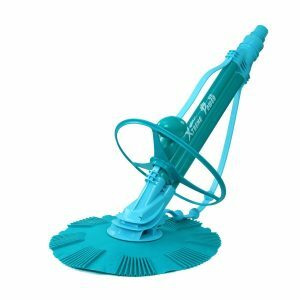 In short, it’s supposed to make you forget it’s even there while it scrubs the inside of your pool clean in the shortest time permitted by the vacuum design. With just one moving part, minimizing the need for maintenance and the chance of something breaking down, it’s a very user-friendly device. Sure, the spike-like deflectors protruding from the suction base may look a bit weird, but aesthetics aside, the BARACUDA cleans pools like almost no other while remaining extremely simple to run and hard to break. Mainly designed for in-ground pools, it works just fine with above-ground designs, too, though much of this depends on the type of pump chosen. As a result of the relatively low weight of the cleaner itself, it climbs any incline without hesitation, no matter the depth. In fact, the G3 continues to work well past the 40-feet industry average for pool depth. Not many pool owners will even be able to make use of this advantage, but an advantage it is nonetheless. On the other hand, there’s the issue of finding the right components to make the BARACUDA as useful in practice as it is on paper. You’ll need the right kind of pump, preferably a variable-horsepower model with a large set of low speeds, and a good filter, too. The fact that the G3 behaves completely differently depending on the equipment attached to it means that many buyers switching from other devices will inevitably feel cheated: Either they put up with an inefficient cleaner, or they go for an upgrade that will gobble their wallet up till only pennies are left. Still, overall, the BARACUDA G3 is one of the best suction cleaners currently on the market. It combines stellar performance with an easy-to-swallow price tag and some nice features. Yes, the whole drama about choosing the right pump can get on your nerves, but the cleaner itself is one capable, practical machine that we can only recommend. Although the names might sound awfully similar, the BARACUDA MX6 is a totally different beast than the G3. This becomes almost painfully obvious when you look at the two machines side-by-side. 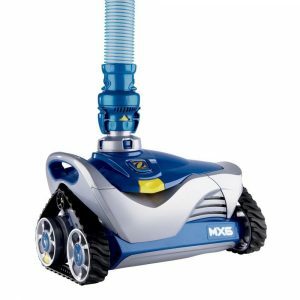 While the G3 looks like any other suction cleaner, the MX6 model follows much of the same design philosophy you’d expect from a robotic model, with its rectangular, bulky body and tank tracks for mobility, aided by a rear-mounted turbine for climbing up walls, instead of a flat, finned disc that rests on the ground. So, how does the MX6 clean? Not unlike most other suction cleaners, actually, and that’s because, when you pry away the exterior dressing, it actually is a perfectly ordinary suction vacuum. Of course, due to the slightly different propulsion system and the large tracks, it doesn’t come into contact with the ground directly as a normal disc-shaped cleaner would, so some more power is needed from the pump to get the same level of suction at times. Unlike many competing models, the MX6 uses cyclonic technology, a term that many will probably recognize from the ad campaign for a number of Dyson vacuum cleaners. Though Dyson’s technology is patented, Zodiac’s approach is really similar, and what it comes down to is that the BARACUDA cleans from nearly every angle, with more power than most regular suction cleaners, but without any extra draw from the pump. What puts a blemish on this otherwise really promising picture the MX6 is painting is the aforementioned mobility. It’s just not that great. While a disc-shaped cleaner never ceases to adhere to any surface, at any angle as long as it’s well-made, the strange combination of wheels, tracks and turbine don’t co-operate as fluidly as the marketing would lead you to believe. The machine getting stuck, only to continue moving some five, ten minutes later if left alone is not uncommon, and though it doesn’t really degrade from the great cleaning performance, it makes the BARACUDA a lot more stressful to live with. Additionally, the seals and some parts of the bundled hose leave a bit to be desired in the build quality department. Still, for those who want a unique-looking cleaner, or are just looking for a bargain, the BARACUDA MX6 is definitely worth a look. It cleans extremely well and is, at least theoretically, as mobile as all those funky-looking Kreepy Krawlys. However, be ready to put up with some minor issues, as this one doesn’t come problem-free out of the factory. Here are top-rated pressure side cleaners. 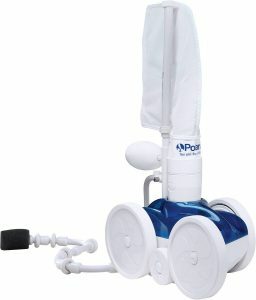 Considered the king of pressure-based pool cleaners, Polaris certainly know their stuff. Their Vac-Sweep 280 is a rather old model, and certainly not high tech in any way, but it will get your job done and fast. 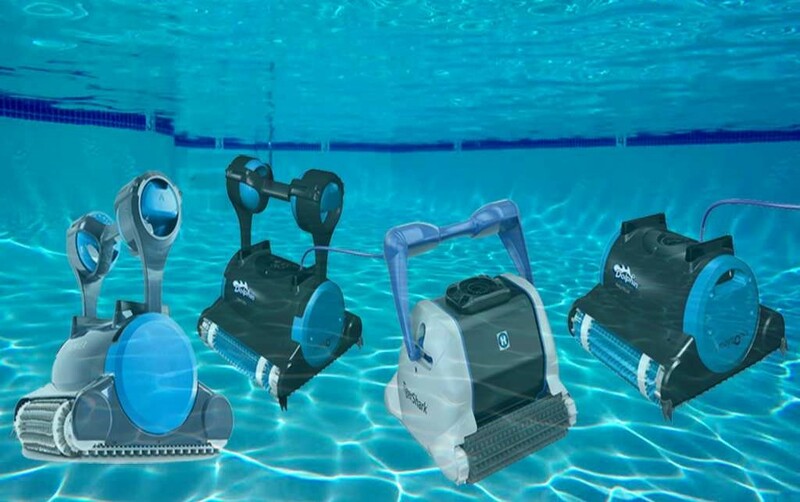 The 280 is rated by the manufacturer to clean an average pool within 3 hours, but in actual testing, the Vac-Sweep often proved to be even quicker than that. Certainly a huge advantage over competing for suction cleaners. Concerning looks, the three-and-a-half wheel design may look quirky, and it is, but somehow, the 280 stays stable no matter where it’s going, and at what angle. Also, surprising is its cleaning power. It easily blows most suction cleaners out of the water—pun intended—and can rub shoulders with some more expensive pressure cleaners, too. Perhaps this sheer force is what enables the 280 to clean most areas in very few passes and manage that impressive speed. Evidently, it’s a great all-rounder that can be used in nearly any kind of pool, no matter in-ground or above-ground, small or large, deep or shallow, round or rectangular. Its neat tail poking out of the rear scrubs the pool floor very effectively, and the included high-volume bag can easily hold any kind of debris, from leaves and rocks to very fine particles of detritus. Build quality is up to Polaris’ high standards, and the Vac-Sweep models are known for their longevity, easily staying alive for more than a decade if well-kept. We wouldn’t call the 280 model ‘problematic’ in any way, but there are some minor quirks here and there, as with every device. First off, the Vac-Sweep needs a booster pump to function properly, which drives up the cost even further than the already hard-to-swallow $500, twice that of a high-end suction cleaner. Then there’s the reliance on certified Polaris components: From the aforementioned pump to the hose and bag, everything you connect to the 280 must be Polaris-branded, licensed and intended for use on this particular model, which obviously limits your buying options and enables the company to hike up the prices on those add-ons. Reliable, well-made, easy to run and powerful. Those descriptors perfectly sum up the Vac-Sweep 280’s core strengths. It’s a great device, that’s for sure, and we can’t think of too many flaws that don’t ultimately come down to ‘perhaps it’s a little too expensive for some’. If you think you can afford to own one, do it. So, what now? We just covered the Polaris Vac-Sweep! True, that, but this is its slightly redesigned, slightly newer sister model, the 360. Unlike the older 280, this one works without a booster pump, while costing almost exactly the same. Sounds like a perfect deal, eh? With almost the exact same feature set as its relative in the product line, differences between the 360 and 280 that do not relate to the lack of a pump in the former are hard to find. The two clean about as quick, about as efficiently and overall, about as well, to be honest. Though the Sweep 360’s tail is of a different design, it seems it makes next to no difference in actual real-world use. One rather noteworthy advantage the 360 has over the 280, though, is the backup valve. The 280 has a slot for one out of the box, but the proper valve needs to be bought and installed separately. With the 360, it’s an integral part of the device. The usefulness of this will depend on how many jagged edges and corners your pool has. As much as the Vac-Sweep 360 seems like a bargain version of the 280 with next to no compromises, that is not the case. You see, Polaris wouldn’t just offer a pump-based system like the 280 for no reason. The truth is that pressure cleaners such as the 360 that do not rely on booster pumps can quickly wear out your pool’s pressure lines and circulation pump. Of course, depending on the strength of those components, this may not be an issue, but then again, most owners will probably not want to risk ruining their pool and having to arrange for expensive repairs and rather opt for the slightly costlier 280 model to stay safe rather than sorry. If your pool can handle it, then, the 360 is a nice alternative to the already amazing Vac-Sweep 280. It has the backup valve that its sister model so conspicuously lacked and all the features that made it so great in the first. Another four-wheeled oddity that looks like it is robotic, but is actually something else entirely, the LL505G by Pentair aims to disrupt the near-monopoly that Polaris has built up over the recent decades within the pressure pool cleaner market. With front-wheel drive, four equally-sized, symmetrically arranged grippy tires on thick, large wheels and an extra-large intake throat and bag, the LL505G’s mission statement is clear: Take Polaris’ Vac-Sweep line, and make everything bigger and worse. Judging by the real-world performance, that approach works surprisingly well. 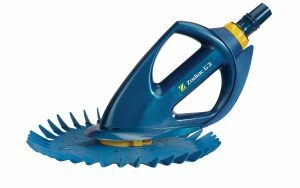 While the suction itself isn’t phenomenal, we still found the LL505G to be pretty swift in its cleaning operation, and it clung to walls and climbed stairs like almost nothing else. The XL-sized bag proved to be really handy, as it never managed to get filled to the brim, no matter the pool size, and much of the same can be said about the four wheels, a drastic stability improvement (although we never saw a three-wheeled Polaris tip over completely during testing) and one that allows the Pentair to be that much faster and maneuver more elegantly around corners and inclines. The LL505G’s downfall is in its name, mostly. Ever heard of Pentair? Neither did we. A small, relatively new name in and of itself is not a bad thing, but in this case, it means that build quality was less than mesmerizing. Of course, that’s almost bound to happen when you compare a lesser-known brand to one that has millions, if not billions of dollars worth of R&D put into their products every year. For the consumer, the buyer, though, this means that a Pentair at the same price as a Polaris Vac-Sweep 280 probably remains less desirable in spite of its technical improvements. A Vac-Sweep, but better and for the same price. What’s not to love? Cheap plastic, that’s what. We desperately wanted to say that this underdog by little-known Pentair, who just ventured into the pool cleaner market a few years back, was the best of the best right away, but that simply wouldn’t have been true. As with everything, you have to expect compromises. We hope you felt this overview of pool cleaners and everything there is to know about them was as much of a treat as we felt it was when we wrote it. We spent hours upon hours compiling the data that led to what you have just read, and we would be tremendously glad if you would stop by in the future. Of course, we don’t write stuff like this purely for your entertainment, and we do hope you learned enough from this so that you can shop with more confidence from now on and buy the products you really deserve. That’s all for this time, folks!